Coned ball flew over my head, just a moment after I was knocked down. I do not know, what is happening. A while ago, I was in the park enjoying a picnic on my castle, when suddenly, I appeared on a green lawn and around me are people dressed in strange uniforms. Unfortunately, I left my gun lying in the carriage. I pick up all the courage I have to get up and chase scampers away. There are another appreciative people, who are tapping me on my back. They are calling me Coach. What´s going on? Like this gentleman from the past, we find ourselves on the pitch of American football in surprising and sudden moment. This world is opened to us by game 1st & Goal, which in 2013 came from the head of Stephen Glenn, illustrated by Scott Heisel and Matthan Fleenora. 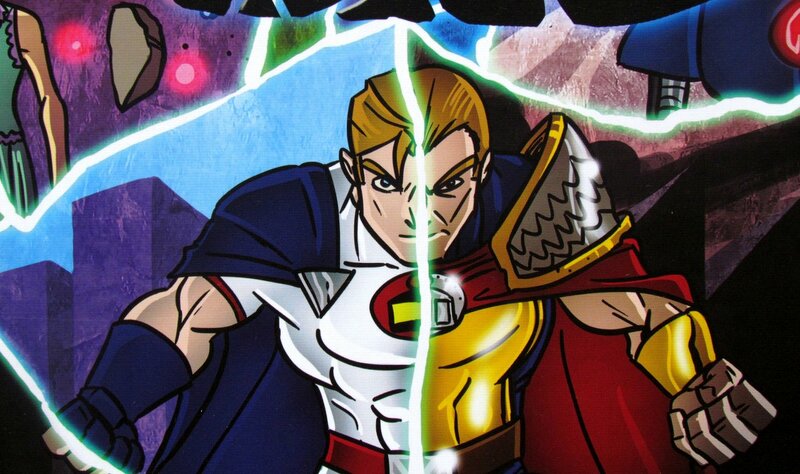 The game was released in the production of R & R Games. Medium square box welcomes us with picture of footballers, who dare each other just before kick off. Inside this box is hidden one large oblong game board with a field. Green lawn has lines specifying distance to both sides. 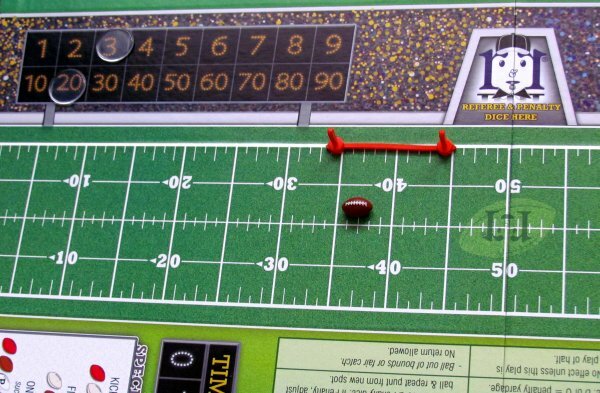 In parallel with lawn, we see two scoreboard, but also place for both coaches with option to mark number of selected timeouts. For the players is also prepared a series of dice with colored sides and numbers, transparent stones for marking the score achieved and there is token in shape of a ball. Core components are two decks of sixty cards, one used for attack and other for defensive. Each such card wears a lot of lines referring to color of dice required to perform actions and representing tactical maneuvers. Players choose roles of home and visiting team and draw to decide, who will start the first half. On the scoreboard, they place two transparent chips and another one on timeouts counter. 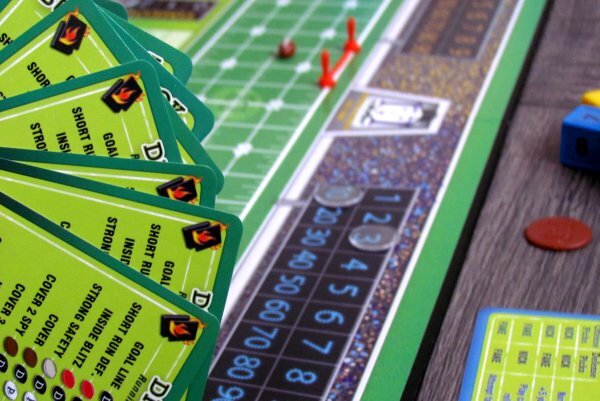 Each coach will also receive one kick-off card and decks for attack and defense roles are passed to players according to their selection. Both then shuffle their deck and draw first eight cards. The match begins with kick-off, which is carried out by defending team, who passes ball into the crowd of strikers (and same thing happens every time, when one team gains points). 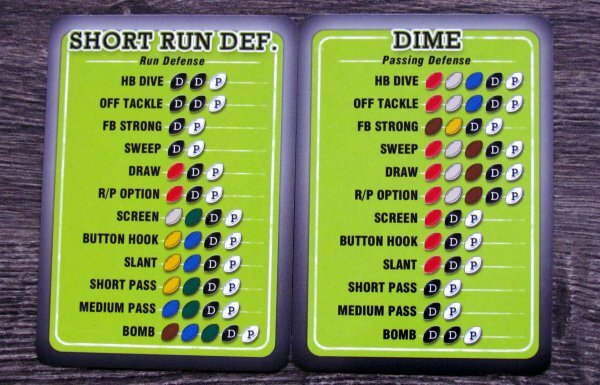 Coach of attackers can choose, whether he prefers a certain position on twenty yard line or tries his luck with dice. The ball is placed on the final position in the first column and denotes first of the four attempts to gain ten yards for attacking team. 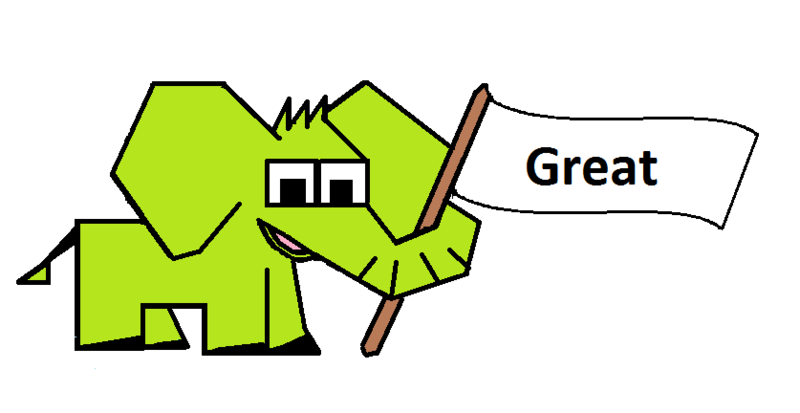 On the right side is placed flag, mark starting and target distances. Team now has four attempts to advance ten yards upfield. Both opponents now select and play one card from their hand face down. Instead, coaches can also ask for a timeout, when he can either replace card on hand or find one of the previously played tactics in the discard pile. Combination of cards always provides another set of dice, that striker has available. 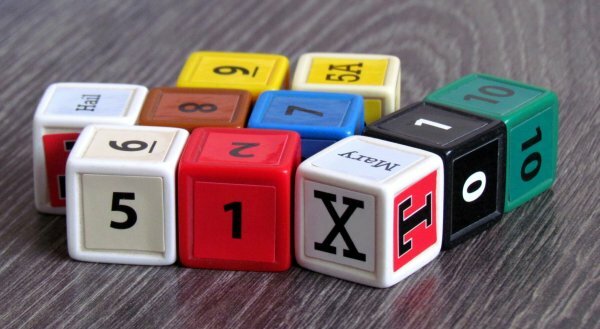 Coach of the team in possession of the ball rolls with these dice and together with one more – a Play dice. Results are summed and defender now rolls only black cube with minus values. Resulting sum is number of yards, that attacking team can move forward. To accomplish shift by ten yards, there is a total of four attempts. For this time, both opponents are playing cards and rolling dice. Each can also draws his hand back to eight cards every time. Whenever attacker manages to exceed the specified line, he acquires four new attempts for next ten yards. This continues until moment, when he fails. At that moment, roles are switched. Coach can order influence things before passing the ball to his opponent. He may attempt a field goal. At that moment, defender rolls two dice and tries to block it, while attacker rolls dice yards, whose value must exceed remaining distance to the destination (minus blocking points). Attacking team gets three points on success. In the event, that the team is too deep in the area to attempt a direct goal, they may use their fourth attempt to kick the ball forward inside the opponent´s territory and slow them down. 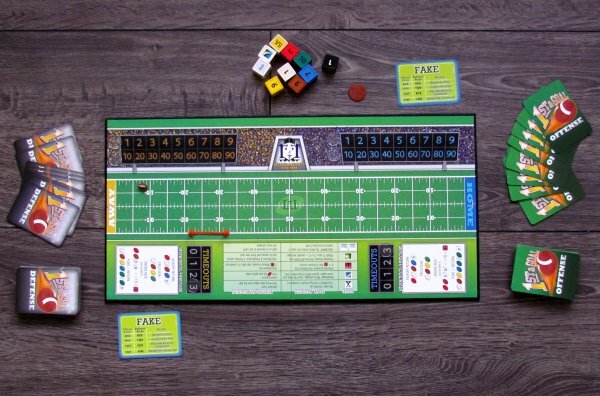 But if the ball crosses a goal line during normal run, attacking team gets six points and can get even bonus seventh in the event of a successful roll of the dice. Conversely, when the defenders manage to push opposing team backwards into their goal territory, they get two points. Half occurs, when an attacker runs out of cards, starting a new half with three new timeouts and new kick-off. At the end of the second half, winning the team is the one, that racked up more points. 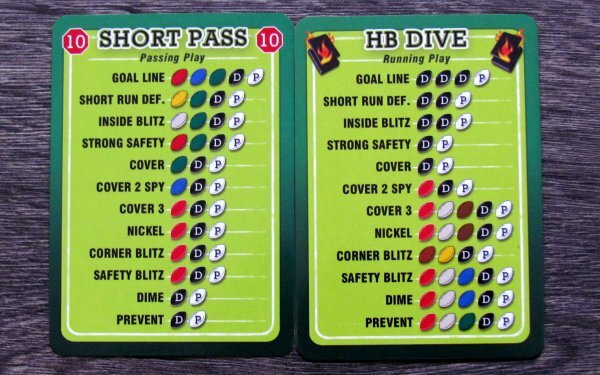 1st and Goal is interesting in all aspects as American football simulation. Because, we are not so familiar with this sport here in Europe, it is not easy at first to understand all the rules. If you are interested, we recommend to watch at least one match on television. Then everything will become clearer. Once you understand principles, all rules give a nice sense and there is nothing extra about it. Lots of events are decided by dice, which makes it quite dependent on luck. But even one or two successful rolls of the dice does not imply, that team is able to score a goal. They must handl tactics really well with cards and see through intentions of their opponent. Understandably more difficult role has defending team, who is watching attackers making progress. Players have choice of a direct attack or passing run. With that, there is a very good mechanism for accelerating the game. 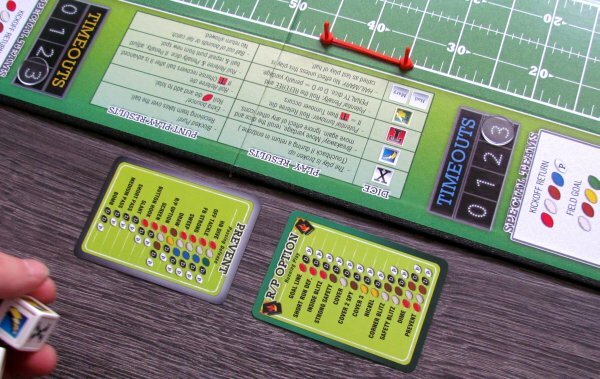 For every running play – a chance to escape enemies and gain greater part of the territory (before you get caught and go down under bodies of defenders) – players have to pay one more card from attacking deck and bring end of the half closer. Coach always chooses tactics, he wants to attempt, but luck in fact ultimately decides in form of roll of the dice. 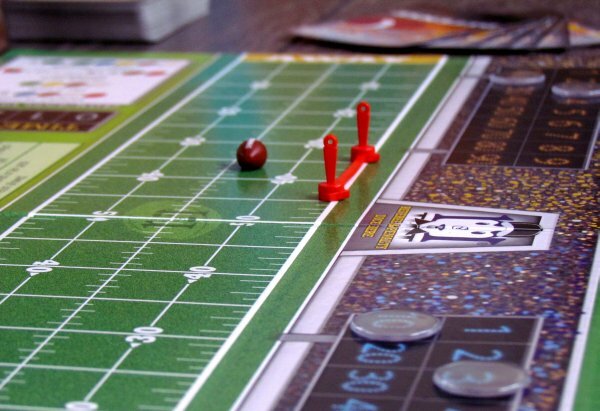 There are of course other minor rules and extension, which you will initially (if you do not know American football) do not want to burden with and allow you to gradually enrich game later. Overall, game really feels, like you are trying to push for territory and therefore adequate experience of a true American football. Every tactic corresponds to a true original and you can see it with a little imagination. 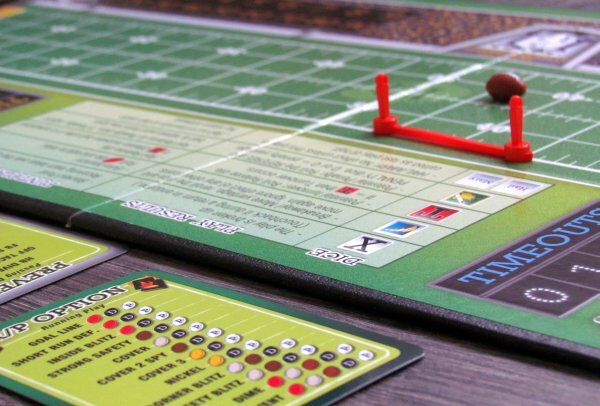 1st & Goal is a strategy game, that allows you to think, plan and execute each step. It´s a nicely flowing fun full of interesting moments, bluffing and efforts to overcome the enemy. Both players are constantly changing in attack and defense, each have their own options and because of this, gaming never falls into stereotype. It´s a constant struggle. Individual half will initially take a little over thirty minutes, allowing you to play the entire game in more than one hour. With time and experience, this time may be shortened for ten minutes per half. Processing is entirely good. 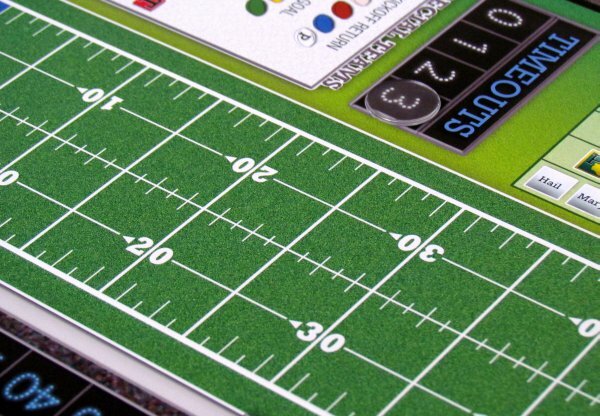 You will definitely appreciate magnetic game board, that will firmly hold the ball as well as territory markings. Dice are not as pleasing, because you yourself have to decorate them with stickers attached. Quality of the cards is good. Authors then offer for fans series of expansions. 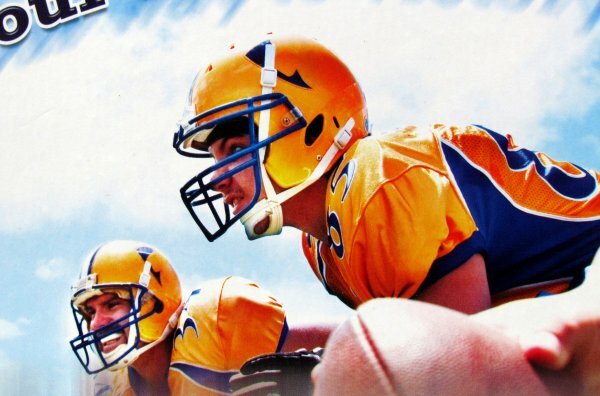 1st & Goal is without any doubt best game about American football we have played. It creates interesting stories and interactions between rivals, while maintains staying simple. Players, who like to roll the dice will enjoy it the most and it can be recommended also to all fans of sport in general. 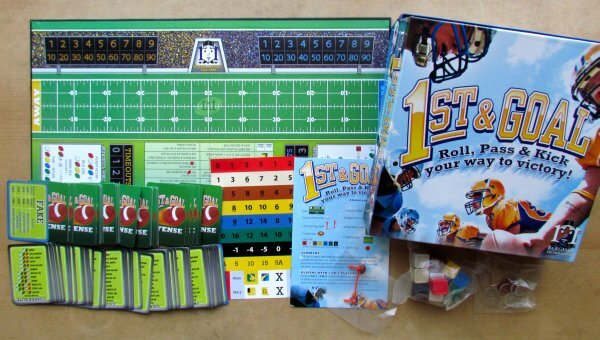 1st & Goal is despite its few minor flaws (and the fact, that it is not quite game for everyone) great game. 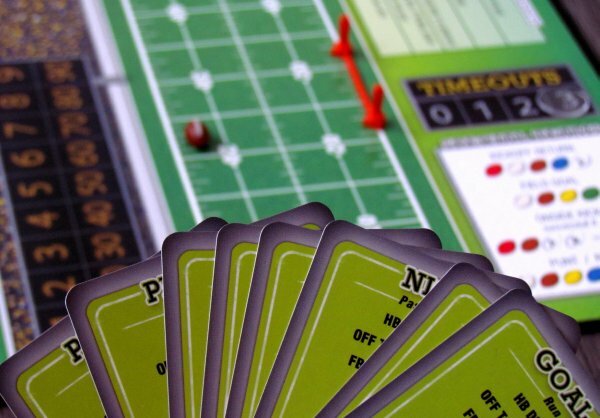 1st & Goal is a game, that uses simple playing cards. 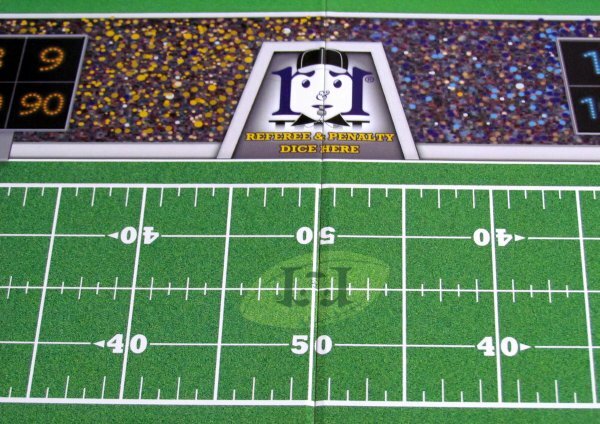 Players will unveil their chosen tactics and after combining, attacker rolls a set of dice, that determine his field gain. 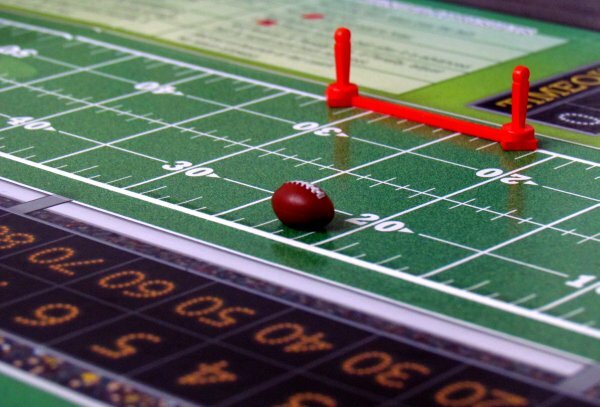 Mechanisms are very closely linked to real sport, which is an advantage for the fans, but disadvantage for players unkissed by American football. 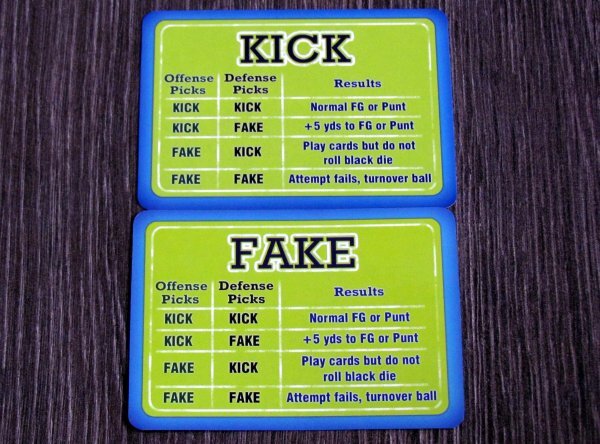 It results in a more casual game, that you can not predict much and hence becomes a little frustrating for the defender. Individual matches are different, but they last a little too long, usually more, than one hour at a time. 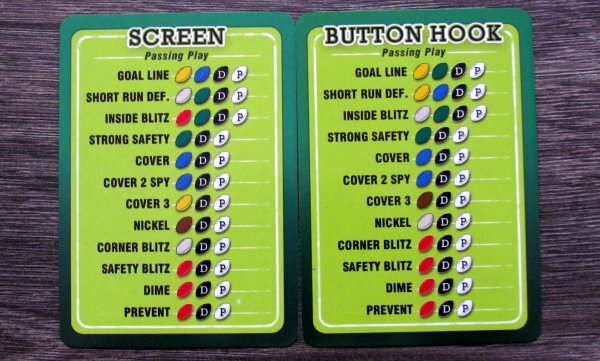 Magnetic game plan is great, but dice need stickers. Luck is present in each turn, but this is just a small thing, because this guarantees your atmosphere. 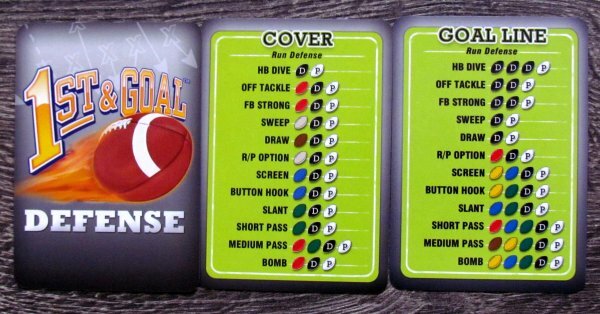 1st & Goal is very fun and interesting game, which is worth attention, especially if you like playing with oval ball.